St. Patrick’s Day is on March 17! Are you ready? Some people may not consider this Irish holiday to be that major but our research shows that nearly 122 million Americans (39% of the population) say they celebrate St. Patrick’s Day. 83% of us wear green, 34% make a special dinner, 31% attend a party, and 25% of us decorate our homes or offices. St. Patrick’s Day spending reaches up to $4.14 billion in America alone! I think it’s safe to say that St. Patrick’s Day is no small holiday. This makes us wonder though, how many of us really know why we celebrate this March holiday? 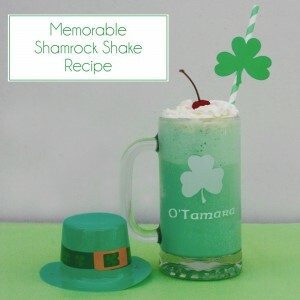 I am happy to say that MemorableGifts.com has the 411 on good ol’ St. Patty’s day and I’m here to share it with ya! Patrick was originally born in Britain, not Ireland. He was kidnapped at age 16 and sent to Ireland as a slave. He eventually escaped but later believed that he’d been called to spread the word of God, so he went back to Ireland. Patrick was successful in bringing Christianity to Ireland and was said to have baptized 12,000 people in a single day! Patrick eventually died but his name lived on forever! Now we celebrate all over the world by turning everything green. We aren’t very sure where the color green plays a role in this holiday but hey it’s fun! How much green you ask? About 40 pounds of green dye are used to turn the Chicago River green. We think it’s time that MemorableGifts.com contributes to the green celebration! What better way to satisfy that need than with a shamrock shake? Join Memorable Gifts in celebrating St. Patrick’s Day! 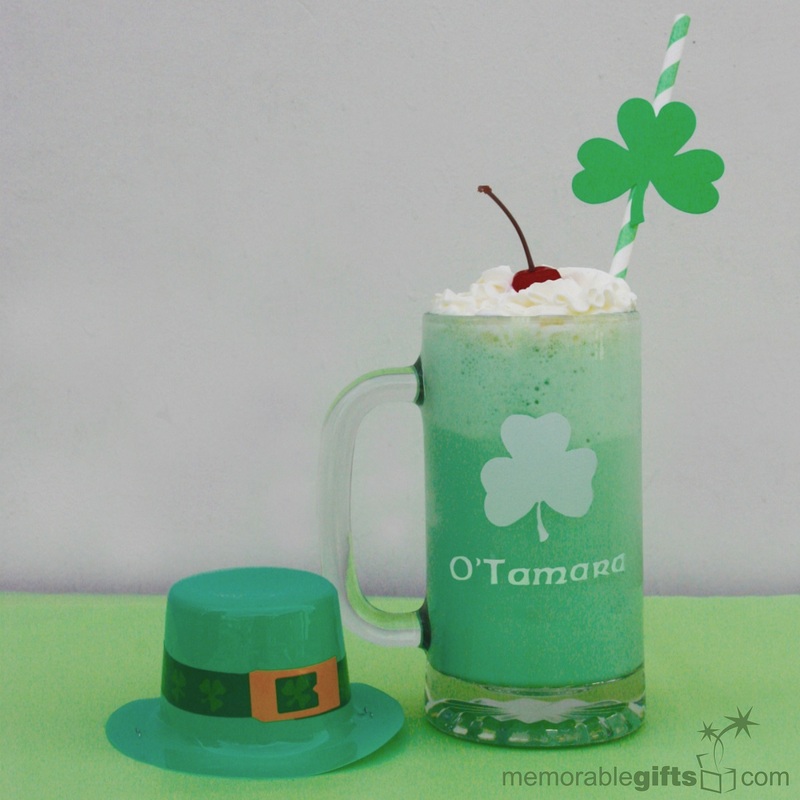 Enter to win a festive Irish beer mug like the one pictured with our shamrock shake. The luck of the Irish will be with our three giveaway winners. The competition will end on St. Patrick’s Day. We can almost see the pot of gold at the end of the rainbow! Cheers! Every St. Patrick’s Day my grandma & I go out to the bars :) We have so much fun!! I use to go to Savannah to see the city turn the river green. Thanks for the giveaway! Wearing of the green and eating corned beef and cabbage (and of course a shamrock shake)! I like the idea of a shamrock shake to celebrate St Patrick’s day! My favorite St. Patrick’s Day tradition is making corned beef and cabbage with fried potatoes on the side. We go to a local pub every year called Bobby O’Briens. Great food and an awesome party! My favorite St Patrick’s Day tradition is making my entire wheelchair green! My mom used to make the best irish soda bread and eat it all week with butter! Going to St Patricks day parade with my family. Me and my friends always go out to this irish bar downtown in my city. It’s tons of fun! Drinking green beer is a tradition! The green beer of course! My favorite is green beer..
Every year we make corned beef with cabbage, carrots and potatoes. Green beer and Irish music! Pick me I have an Irish last name, Draughon!! March is the start of Spring! All things green. We drive down to Savannah and take in the festivities on River Street. Corned Beef and Cabbage for the whole Conley Clan! I’ll be going to an Irish pub that just opened up in the city to enjoy some live music while trying Irish beer for the first time. I was born on st. Patricks day and I’m irish so to me this is the best day of the year. When I was little my grandmother always bought me a green outfit for my birthday. My favorite St Pattie’s day tradition is green beer! We love having corned beef and cabbage. Making corned beef and cabbage. i love making green pancakes for breakfast! We like to make ruben subs for dinner. My kids never liked them but now that they are older they love them, go figure. I love pork and cabbage dinner! I like my Moms corn beef and cabbage. We go to a parade every year. Wearing green drinking lots and having fun are my traditions! My tradition is always having a mug of green beer!